Coming from a farming background in England Jacquie grew up with Border Collies and began handling and training Dogs at the early age of 9 years. Arriving In Perth Western Australia in 1973 Jacquies interests led her to training with the Gosnells Dog Obedience Club, Cloverdale Companions and the Mundaring Dog Club to name just a few. Going on to compete in obedience trials with an Australian Cattle Dog cross and a Bull Terrier cross Jacquie soon became hooked on training Dogs. As an accredited instructor/trainer Jacquie continues to update her knowledge through ongoing studies, research and workshops. Over the last 33 years Jacquie has instructed at numerous clubs, conducted workshops, clinics and classes covering all aspects of Dog handling, behaviour and management. Jacquie was actively employed by the Animal Management and Resources Extensions Services for eight years before extending her own business. Her wealth of animal experience also stems from a career as a Kennel Maid, Veterinary Nurse and Veterinary Practice Manager. Jacquie’s skills have now extended to training Tracking Dogs with a number of her own Dogs holding Tracking titles and Championships. She shared her knowledge through instructing with Trackwest (Inc) and now through her own workshops. Many years have been given to retraining rescue Dogs and finding them new and happy forever homes. Jacquie specialises in helping owners and handlers resolve issues with rescue Dogs often caused by abuse, mismanagement or neglect. 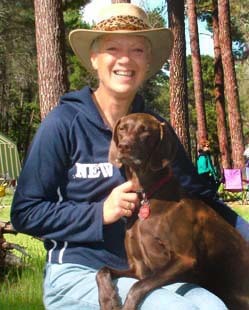 Many of her own Dogs over the years have been rescue Dogs most of which went on to enjoy life and compete successfully. To all of these wonderful Dogs Jacquie owes her wealth of knowledge as she states “The Dogs in my life have been my greatest teachers”. Over the years Jacquie has owned and trained many breeds such as the Border Collie, Basenji, Germans Shepherd, Australian Cattle Dog, Labrador, Golden Retriever, Doberman, German Shorthaired Pointer and Australian Shepherds along with many cross breeds. These days Jacquie gains enormous satisfaction from sharing her knowledge and helping owners to gain a better understanding of their canine companions through her classes at her training centre in Stoneville east of Perth. • Dip Horsemanship – VN.